Welcome to Hitchcock & Associates. 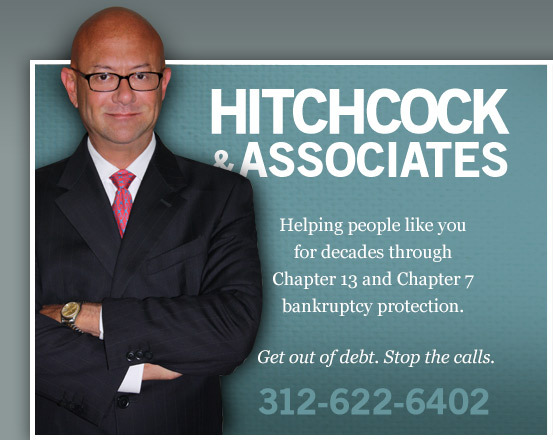 At the law office of Hitchcock & Associates, we offer bankruptcy assistance and debt relief for clients throughout Joliet, Chicago and the surrounding areas. We have spent decades providing crucial debt help and asset protection for our clients while helping them rebuild stronger financial lives. Whether you need a Chapter 7 bankruptcy attorney or Chapter 13 bankruptcy lawyer, you can depend on us to provide you with quality legal services. We provide personalized, one on one service to help you with all aspects of debt settlement and debt relief in the areas of consumer bankruptcy and commercial bankruptcy. As bankruptcy attorneys proficient with all aspects of bankruptcy law, we can help you to stop foreclosure, put an end to vehicular repossession, and protect yourself from creditor harassment. Attorney Hitchcock has a vested interest in helping you achieve the results you are looking for in your bankruptcy case. We explain everything in detail so you know what the process of filing for bankruptcy entails. As your legal advisor, we will make certain that you make the choices that are best for your financial situation. Whether you need a repossession attorney or a business bankruptcy lawyer, you can expect the highest caliber of legal representation. Our consumer and small business bankruptcy lawyers make certain that you are both comfortable and confident with seeking protection from your creditors. Contact us for more information about our services and browse our website to learn more about the bankruptcy process. Call us for a consultation at 312-551-6400 or email us at tom@tomhitchcock.com today. We look forward to providing you with the debt relief you deserve.